Since Martinique is a popular tourist destination, there is a spirit of hospitality toward travelers. It is always acceptable to ask for directions, and, since the streets aren’t necessarily marked when one gets outside of the towns, it is often necessary to ask directions. 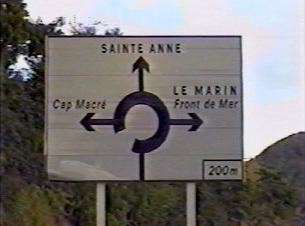 Maps of the major roads are available at the tourist information center in the main city, Fort de France, and at the airport. Many of the towns of Martinique are divided into quarters. When writing down an address, the name of the quarter may be essential if the street has no name. However, Martinique is small enough that there is rarely a problem finding a destination. Given that Martinique is an upscale international vacation destination, it is no surprise that there are numerous five star hotels on the island. These hotels offer the usual amenities of room service, restaurant, laundry, and pool, but also often have casinos and ballroom dancing with performances by local dance groups or singers. There are some less expensive hotels, or one can look into renting anything from a cabin to a villa. The less expensive accommodations are often found in travel guides or through word of mouth. The larger, more expensive properties can be rented through travel or rental agencies on the island or in France. Many people who come to Martinique stay with friends or relatives, which is always a good way to enter into the heart of any travel destination.